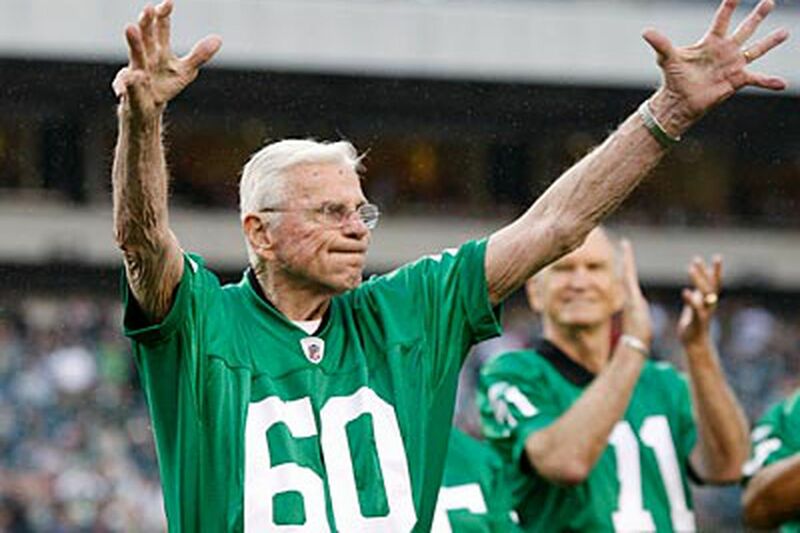 Eagles great Chuck Bednarik was released Tuesday night from St. Luke's-Fountain Hill hospital in Bethlehem, where the 85-year-old has been since early last week. "There's no reason why he shouldn't be back on his feet in a couple of days," his son-in-law, Ken Safarowic said. "He left with a clean bill of health." "He was a little anemic and dehydrated," Safarowic said. "I don't think it was any one significant issue. A bunch of things just ganged up on him at the same time. The heart and organs weren't affected. He's in a good shape otherwise." Safarowic said calls have been pouring in from around the country, from college and pro teammates, the Hall of Fame and many others. "It's been overwhelming," he said. "Everybody sends their best wishes. We've got to hang on to him for a while. There are not many guys from that era. "Chuck has another game-saving tackle left in him."